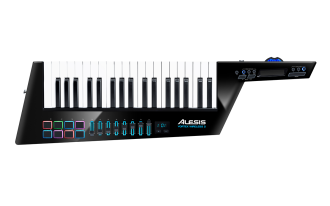 Take back the stage and experience untethered keytar performance with the next-generation Alesis Vortex Wireless 2 keytar MIDI controller. Featuring improved ergonomics for better playability, a more durable housing, and an updated control layout, the updated Vortex Wireless 2 offers comprehensive MIDI controller functionality in a stylish and stage-ready keytar design with a stunning gloss-black finish. Wireless MIDI -- USB Receiver Dongle Included! This dynamic MIDI keytar controller connects wirelessly to your computer and easily integrates with popular virtual instruments, plugins, and DAWs. For maximum stage and studio mobility, the PC- and Mac-compatible USB dongle uses a single USB port to establish a reliable, wireless connection. Create dynamic, expressive performances that the audience will both see and hear. Vortex Wireless 2 includes a premium bundle of virtual instrument plug-ins, including Hybrid 3, Loom 2, Vacuum Pro, and Xpand!2 from AIR Music Tech, and TimewARP 2600 by Way Out Ware. For performing, producing, recording, Alesis includes Ableton Live Lite. Finally, a clear, concise, and easy-to-use point-and-click preset editor is included, so you can quickly configure any parameter of any preset on your Alesis Vortex Wireless 2. You can also use the editor software to save and load all of your Vortex presets to and from your hard drive for easy backup. Available until 11 PM (EST) today. Mention special code 20C-7HX7 when you call.